Top up loan is designed for a member who took a development loan to undertake a specific project, but ran out of money in the middle of the project due to one reason or another. The loan will run parallel to the original loan and will be pegged to the remaining repayment period of the original loan. In this case the member will pay two separate loan repayments but the two loans will end at the same time. This loan is suitable to those members with sufficient income to support several independent loans and don’t what to incur any commission to consolidate their loans like in the case of a Mega loan. 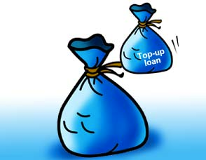 Top up loan is an option to a Mega loan.